If you are in the market for a new monitor to join your mature PC rig setup, then you may as well invest in yourself and give yourself the pleasure of having the best hardware around you. Thankfully, with this deal, we can instantly save you money on this gorgeous 27-inch HP LED offering. The first thing that you are going to notice is just how aesthetically gorgeous this product is. It has a highly appealing, ultra-thin design built from lightweight, high-strength metal with a matte finish and high-polished resin. In a modern office environment, or even in the home, this monitor is going to fit right in and actually act as the focal point of your computer rig. From a looks perspective, it “looks” as though it should have a huge price-tag associated with it. But, it doesn’t. The monitor comes with a vivid IPS panel offering a micro-edge display which delivers ultra-wide viewing angles as well as a crisp and clear picture that immediately introduces an expansive viewing experience. And let’s be honest here; this is a monitor, which means that the viewing experience is paramount to this product offering a great user experience. From a “key features” perspective, it offers a display system that displays each image with intensity and realism. It has full 1080p high definition offering over 2 million pixels in order to make pictures and text ultra clear and sharp. 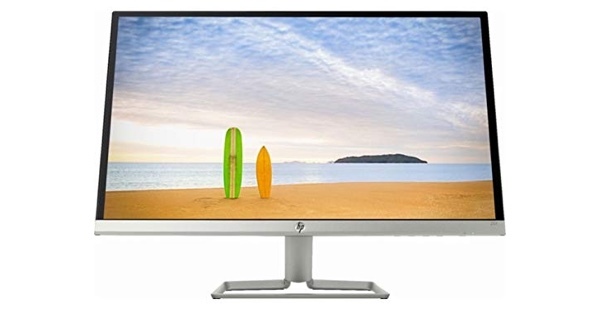 It also has a 10M:1 Dynamic Contrast Ratio that is designed to offer deeper blacks and much brighter whites through “contrast and dimensions.” Given that this is an HP monitor with a stunning design and highly impressive performance, this falls under the “must-have deals” category. And you can find everything that you need below to actually have it. If you are ready and waiting to make the investment in this stunning HP LED monitor, then in the first instance allow us to congratulate you on a decision well-made. You will find everything that you need to know from the product link below, including immediate access to a stunning 25% discount that sees you save $50 on the recommended purchase price.